Do you want to study at a reputable and highly rated institution in Canada? Do you want to meet certified immigration experts who will make this easy for you? 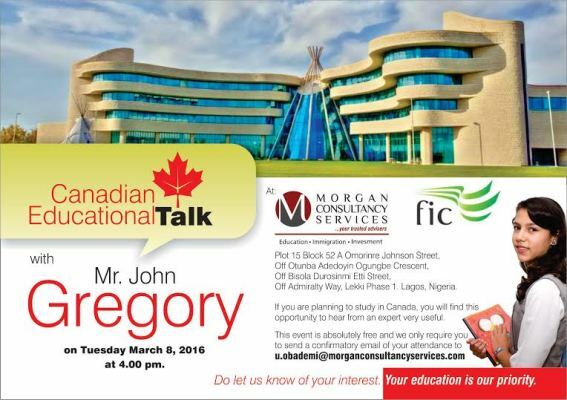 Come meet Mr. John Gregory the Marketing Director, Fraser International College, as he demystifies the prerequisites to studying in Canada. Morgan Consultancy Services will process your admission and visa promptly. Bring along your WAEC result and international passport data page for immediate assessment. Admission ongoing for 2016 and January 2017 start dates. Off Admiralty Way, Lekki Phase 1. Attendance and application at the seminar is absolutely free!